When you form an LLC and become an owner, you put money into the business to get it started. An owner of an LLC is called a "member," and the owner is not an employee. Your contribution to the LLC as a member is called your capital contribution, your contribution to the ownership. This capital contribution gives you a share in the LLC, and the right to a percentage of the profits (and losses). If you are the only member, you have 100% of the ownership. If the LLC has several owners, each owner's share is determined by agreement, usually a formal operating agreement. Member contributions may be made in cash or non-cash (property, for example). Property contributions must be listed and described and the members must agree on the fair market value of non-cash contributions. How Is My LLC Ownership Recorded? Once you have put money into the LLC, your capital contribution and the contributions of other members is shown in the LLC's balance sheet as an equity account. The member's capital account records the initial contribution and any additional contributions made. The capital account also records each member's share of the profits or losses of the LLC. Let's say, for example, that a member's initial contribution is $10,000, and that member has a 50% ownership in the LLC. If the LLC has a profit of $5,000 in the first year, that member's capital account would include the member's share of the profit and be listed as $12,500 as of the end of the year (the initial $10,000 plus $2,500 from the year's profit). The member's capital account also records money the owner takes from his or her capital account if these are allowed by the operating agreement. How Much Do I Have to Contribute to the LLC? Initial capital contributions on the formation of the LLC may be any amount. Members usually contribute enough to pay startup expenses and assets. In some cases, inadequate capitalization could be a factor in disregarding an LLC and finding the members personally liable for the debts or obligations of the LLC. If your LLC has particularly significant risks or liabilities, it may be necessary to have a greater capital contribution. One of the main reasons the LLC business form is used is that it's considered to be separate from the owners for liability purposes. 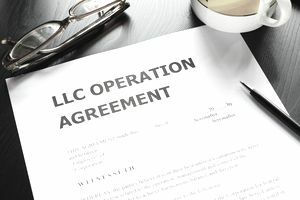 "Disregarding the LLC" means that the LLC is not separate from the owner(s) and that the owner(s) are liable for the debts and obligations of the business. How Much Can I Take Out of the LLC? You can take as much as you want from the LLC, as long as it doesn't violate the terms of the operating agreement. If you are the only member, you can take out what you want, but you must leave enough money in the business for its normal operations. The money you take out of the LLC is not a salary because you aren't an employee. It's a withdrawal or distribution. Your contribution percentages can be different from distribution percentages, again, depending on the agreement you made with other LLC members. For example, initial member percentages of ownership can be set by the operating agreement and the agreement can set different percentages of the share of the profits/losses. The members can do anything they want as long as it isn't in conflict with state law, as long as there is agreement, and the agreement is stated in the operating agreement. What Should I Put Into the Operating Agreement About Capital Contributions? Penalties for failure to make required contributions. LLC operating agreements have some suggested language for the operating agreement. Can I Loan Money to the LLC? LLC members may also loan money to the LLC, separately from their capital contributions. The terms of a member loan to an LLC, like any other owner loan, should be documented carefully in a loan agreement, specifying the amount, interest rate, repayment terms, and default provisions. A loan by a member does not change the member's capital contribution or distribution of profits and losses. Read more about the difference between investing in a business vs. loaning to a business. What If I Am the Only Member of the LLC? Even if you are the only member, it's a good idea to have a one-member operating agreement and provide details about your ownership, distributions, and profits/losses. Most states do not specify capital contribution amounts, but some states have requirements for LLC operating agreements that may affect capital contributions, so be sure to check with an attorney in your state before you form an LLC and create an operating agreement. This article includes general information; the author is not an attorney or CPA and no legal or tax advice is being provided. State laws and individual circumstances may vary; consult your attorney before you make any decisions or take any actions that could affect your business.